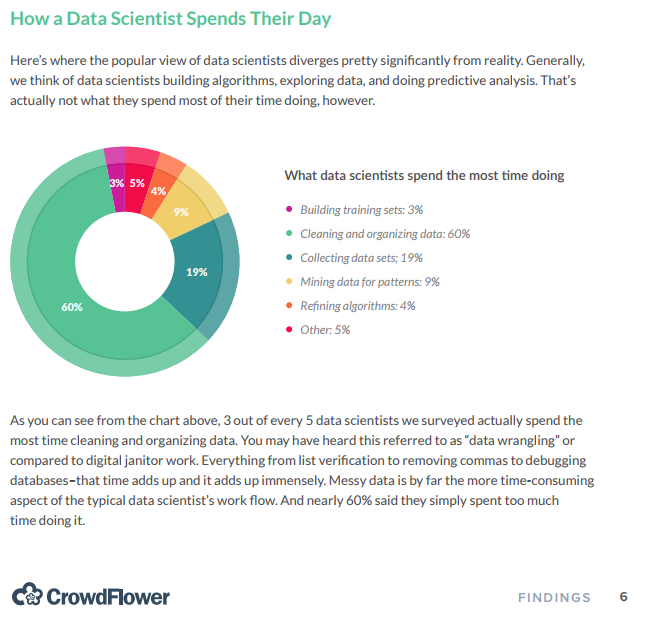 According to a survey by CrowdFlower, data scientists spend most of their time cleaning and manipulating data rather than mining or modeling them for insights. As such, it becomes important to have tools that make data manipulation faster and easier. In today’s chapter, we introduce you to dplyr, a grammar of data manipulation. what is the average order value by device types? what is the average number of pages visited by purchasers and non-purchasers? what is the average time on site for purchasers vs non-purchasers? what is the average number of pages visited by purchasers and non-purchasers using mobile? The first example we will look at filters all visits from device mobile. As we had learnt in the previous section, the first argument is our data set ecom and the next argument is the condition for filtering rows. Let us apply what we have learnt to the case study. We want to filter all visits that resulted in a purchase. After filtering the data, we need to select relevent variables to compute the AOV. Remember, we do not need all the columns in the data to compute a required metric (in our case, AOV). The select() function allows us to select a subset of columns. The first argument is the name of the data frame and the subsequent arguments specify the columns by name or position. To select the device and duration columns, we specify the data set i.e. ecom followed by the name of the columns. We can select a set of columns using :. In the below example, we select all the columns starting from referrer up to order_items. Remember that we can use : only when the columns are adjacent to each other in the data set. What if you want to select all columns except a few? Typing the name of many columns can be cumbersome and may also result in spelling errors. We may use : only if the columns are adjacent to each other but that may not always be the case. dplyr allows us to specify columns that need not be selected using -. In the below example, we select all columns except n_pages and duration. Notice the - before both of them. For our case study, we need to select the column order_value to calculate the AOV. We also need to select the device column as we are computing the AOV for each device type. But we want the above data only for purchasers. 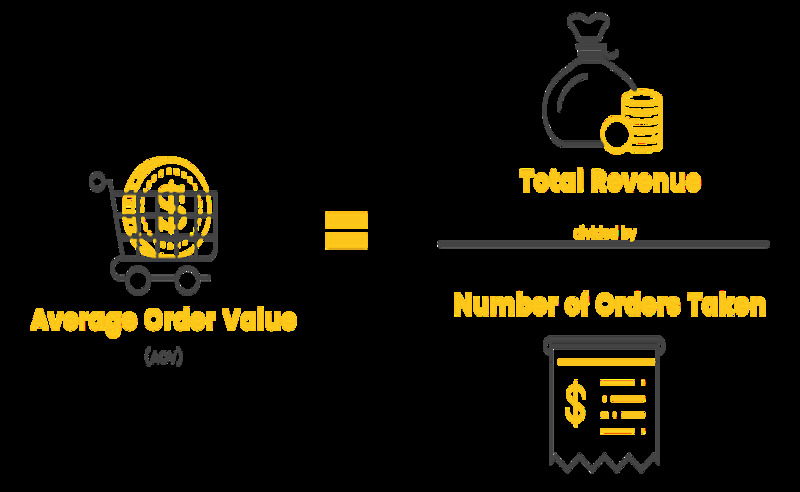 Let us combine filter() and select() functions to extract order_value and order_items only for those visis that resulted in a purchase. We need to compute the total order value and total order items for each device in order to compute their AOV. To achieve this, we need to group the selected order_value and order_items by device type. group_by() allows us to group or split data based on particular (discrete) variable. The first argument is the name of the data set and the second argument is the name of the column based on which the data will be split. To split the data by referrer type, we use group_by and specify the data set i.e. 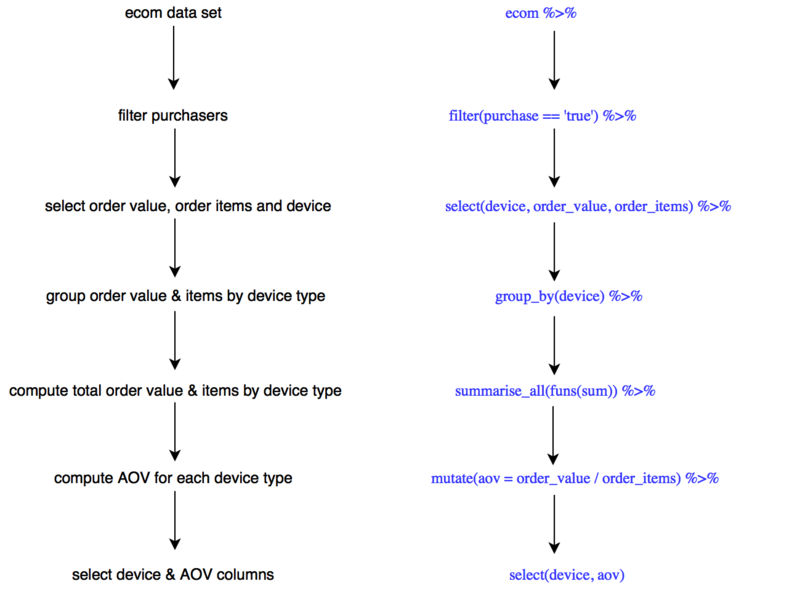 ecom and the column based on which to split the data i.e. referrer. In the second line in the previous output, you can observe Groups: referrer  . The data is split into 5 groups as the referrer variable has 5 distinct values. For our case study, we need to group the data by device type. The next step is to compute the total order value and total order items for each device. i.e. we need to reduce the order value and order items data to a single summary. We can achieve this using summarise(). As usual, the first argument is the name of a data set and the subsequent arguments are functions that can summarise data. For example, we can use min, max, sum, mean etc. Now let us compute both the mean and the median. Another way to achieve the above result is to use the summarise_all() function. How does that work? It generates the specified summary for all the columns in the data set except for the column based on which the data has been grouped or split. So we need to ensure that the data does not have any irrelevant columns. Let us compute mean and median number of pages for each referre type using summarise_all. So far, we have split the data based on the device type and we have selected 2 columns, order_value and order_items. We need the sum of order value and order items. What function can we use to obtain them? The sum() function will generate the sum of the values and hence we will use it inside the summarise() function. Remember, we need to provide a name to the summary being generated. There you go, we have the total order value and total order items for each device type. If we use summarise_all(), it will generate the summary for the selected columns based on the function specified. To specify the functions, we need to use another argument funs and it can take any number of valid functions. To create a new column, we will use mutate(). The first argument is the name of the data set and the subsequent arguments are expressions for creating new columns based out of existing columns. Let us add a new column avg_page_time i.e. time on site divided by number of pages visited. We can create new columns based on other columns created using mutate. Let us create another column sqrt_avg_page_time i.e. square root of the average time on page using avg_page_time. Back to our case study, from the last step we have the total order value and total order items for each device category and can compute the AOV. We will create a new column to store AOV. ## 1 laptop   56531     31 1824. ## 2 tablet   51321     36 1426. ## 3 mobile   51504     36 1431. The last step is to select the relevant columns. We will select the device type and the corresponding aov while getting rid of other columns. Use select() to extract the relevant columns. Arranging data in ascending or descending order is one of the most common tasks in data manipulation. We can use arrange to arrange data by different columns. Let us say we want to arrange data by the number of pages browsed. If we want to arrange the data in descending order, we can use desc(). Let us arrange the data in descending order. Data can be arranged by multiple variables as well. Let us arrange data first by number of visits and then by number of pages in a descending order. If you observe ecom6, the aov column is arranged in descending order. If you observe, at each step we create a new variable(data frame) and then use it as an input in the next step i.e. the output from one step becomes the input for the next. Can we achieve the final outcome i.e. ecom7 without creating the intermediate data (ecom1 - ecom6)? Yes, we can. We will use the %>% operator to chain the steps and get rid of the intermediate data. Below we map the description of each step to dplyr verbs.